Check out this fun new Christmas activity book - from that silly bear family we all know and love: The Berenstain Bears! 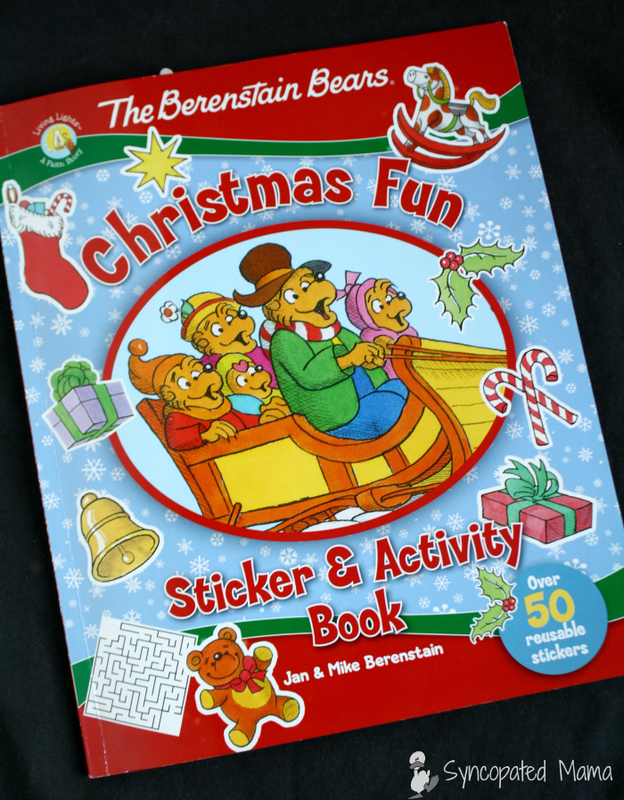 We love the Berenstain Bears around here - I have such fond memories of so many of their books from when I was little and since the themes and illustrations in them are so timeless, they're some of Gv's favorites, even today! This glossy book is about the size of a standard piece of copy paper. It has 32 pages and over 50 reusable stickers - some to be placed in specific spots and some to place as imagination dictates. This paperback book has thick, glossy pages so that the stickers can be more easily moved around - and it's as easy to cart around as a magazine! We'd been out of the house the day this arrived, so we got home just in time for me to start dinner and Gv begged to explore this fun new book right away. She played with it all through dinner. And through our after-dinner family time. And even for hours after G went to bed - she probably would have stayed up all night playing with it, if I hadn't torn her away from it and carted her off to bed! I couldn't believe how much she enjoyed this book - and she had only just been using the stickers - she hadn't even started the other activities yet! Although some of the activities in this book (like the word search and crossword puzzle) will need to wait until Gv's a bit older, she can do things like this maze right now - when she takes a break from all the sticker fun! 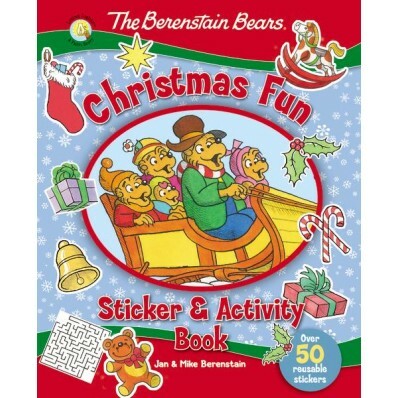 This book is well worth the small investment and the fact that the stickers can be moved around means that we can pack it away with the other Christmas books, then pull it out and enjoy it all over again year after year! My favorite part of this book was its treatment of its topic. 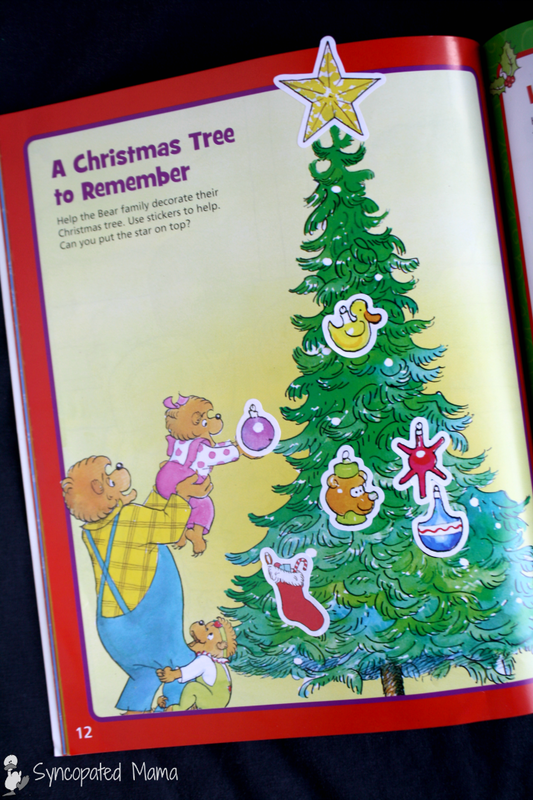 One thing I always appreciate about Berenstain Bears books is that they focus on Christian themes and values, but in a gentle way that people of any faith can appreciate. The same goes for this book. 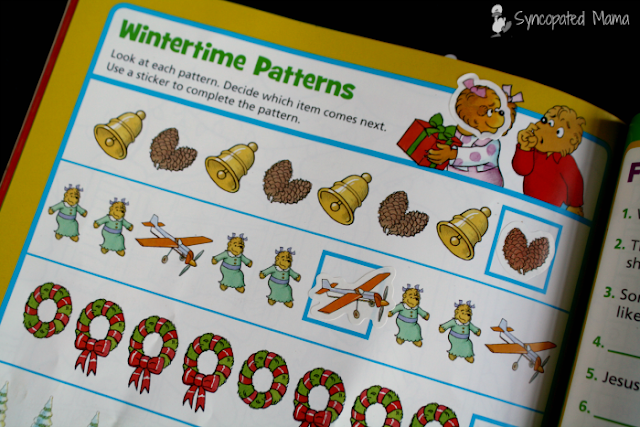 It centers around themes like the first Christmas, the Nativity, and baby Jesus, but seamlessly weaves in Christmas trees, stockings, and presents as well. 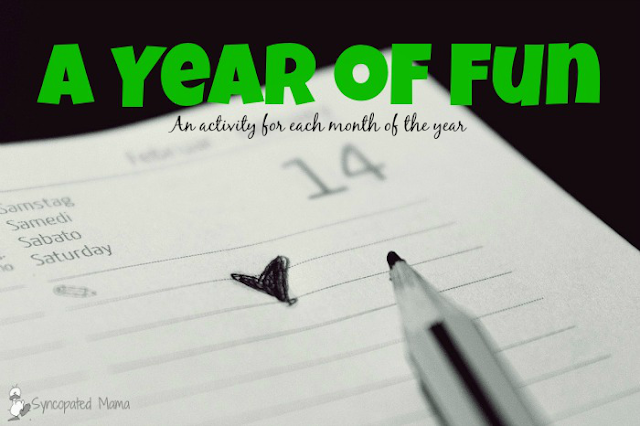 And there are so many different types of activities on its pages. The stickers can be enjoyed by the youngest readers and there are plenty of pages to keep older elementary-aged kids interested, too. 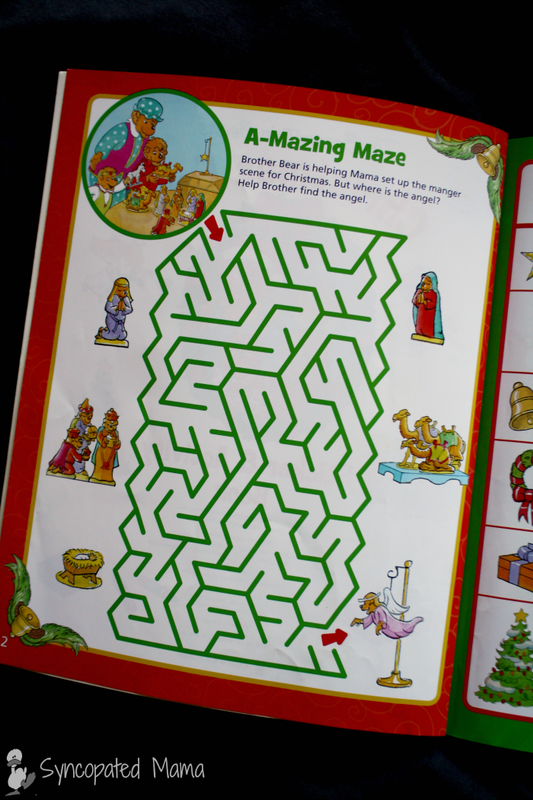 Like the book I shared with you here, I think this activity book would be perfect to keep in the car as you run errands this holiday season or to keep little ones occupied while waiting for appointments, to pull out as a quiet activity during church, or the perfect answer for all those endless miles traveled during a Christmas trip! I heartily recommend this book to anyone looking for something fun (& quiet!) 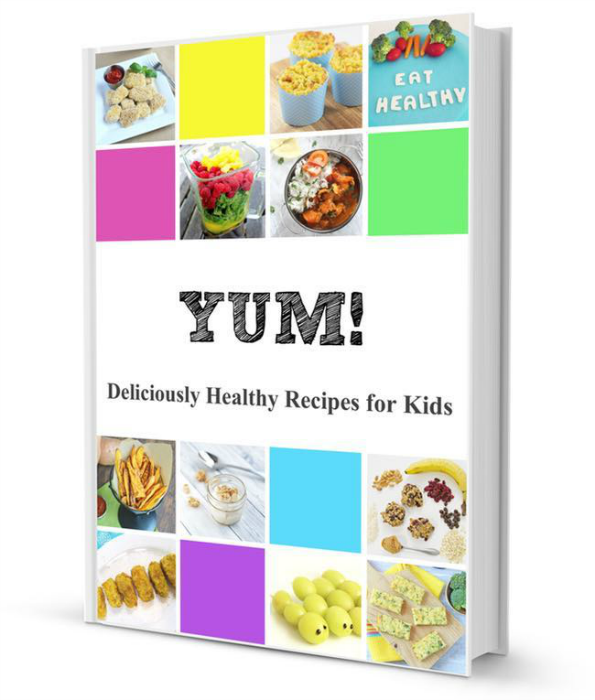 to occupy kids from the toddler to elementary ages. Have you been looking for a fun addition to a special child's stocking this year, or just a great new book to keep little ones engaged during all the holiday travel? I'd love to hear! 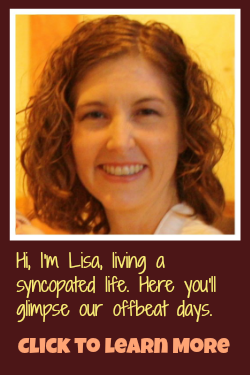 Either leave a comment below or email me at lisahealy (at) outlook (dot) com.